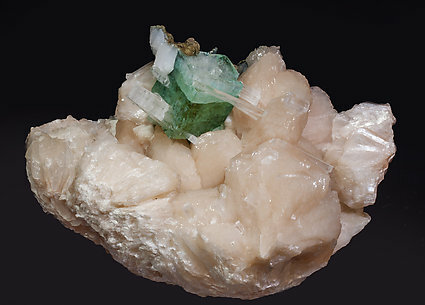 Aggregate of tabular, translucent and bright crystals with a very well defined color zoning, pale green on the outer area and darker in their interior. 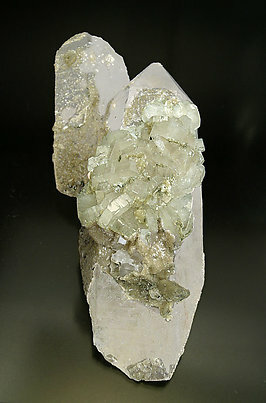 They are with small Quartz crystals. 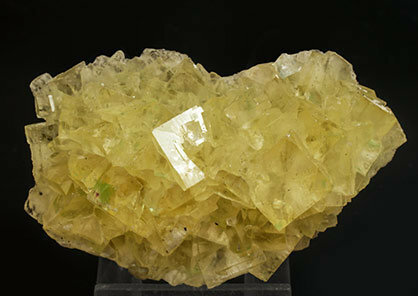 At Panasqueira, this kind of Fluorapatite is well known as “olho de boi” (ox eye) and this sample is of very high quality compared with most of the pieces showing this feature. 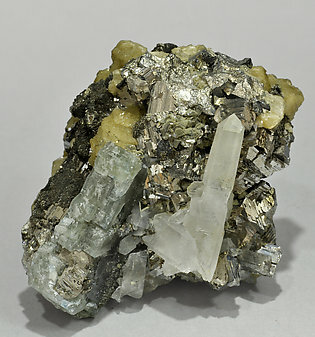 Aggregate of short prismatic Fluorapatite crystals, between translucent and transparent, with a clear green color and grayish shades and partially coated by white, small, Quartz crystals and Pyrite crystals. 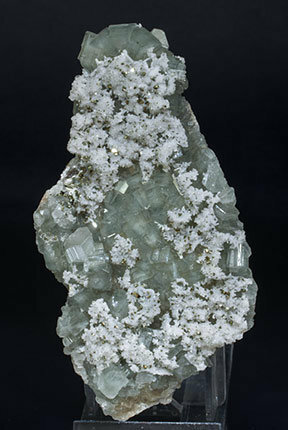 Fluorapatite well positioned on its matrix of quartz covered with siderite. 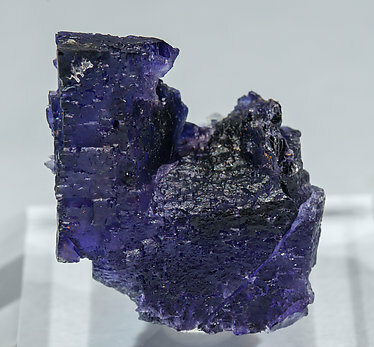 Although the color of the Fluorapatite is not intense the photo does not do it justice. 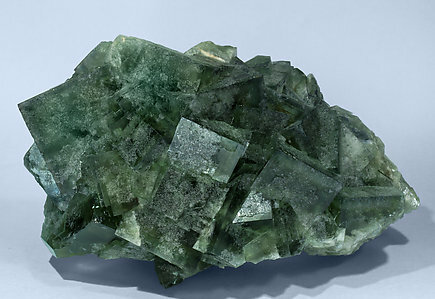 Thin tabular Fluorapatite crystal, transparent, with very well marked concentric geometric color zoning and implanted on a matrix of Quartz crystals with small Arsenopyrite crystals and Calcite coatings. 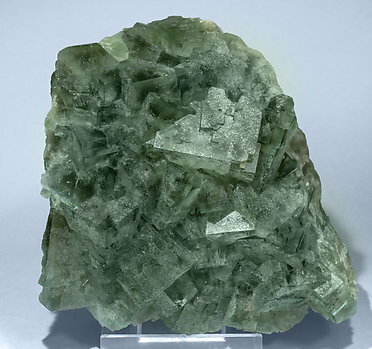 Aggregate of short prismatic Fluorapatite crystals. 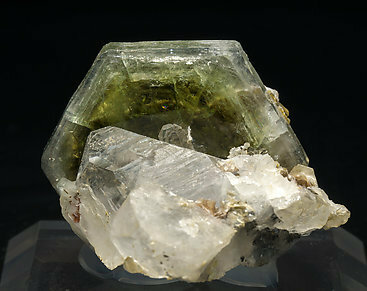 They are translucent, bright, have a pale green color and are coated by Siderite on the back on the sample. 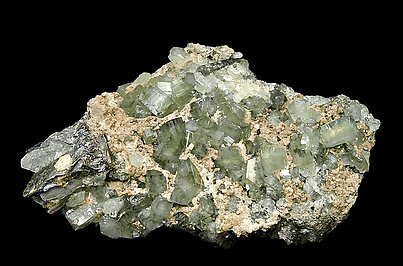 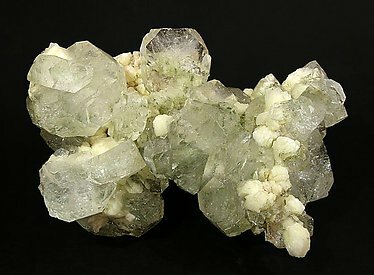 Group of crystals of Fluorapatite, with an attractive pale green color and excellent brilliance, on matrix, with Muscovite and Siderite. 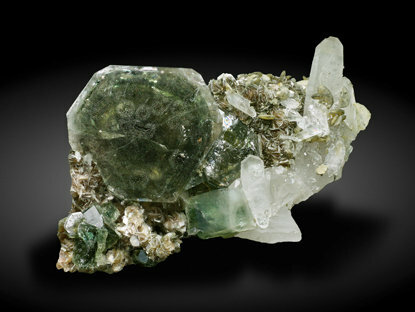 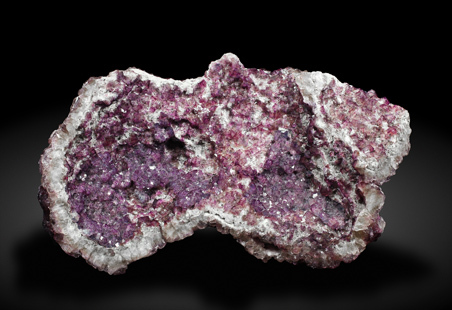 Very aerial single crystals, doubly terminated, between transparent and translucent, bright, with a zoned violet color and on a matrix coated by Chlorite, with Muscovite and lenticular Siderite crystals. 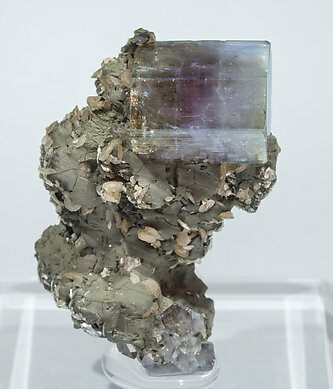 A novelty at Tucson 2014. 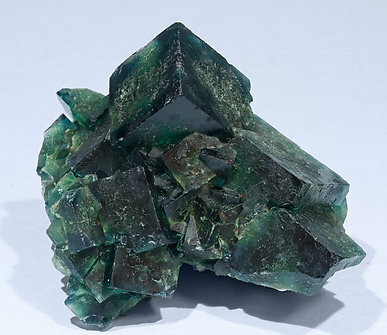 Complex group of Fluorapatite crystals, very rich with crystalline forms including a translucent dominant prism with parallel growths and with small Tourmaline crystals. 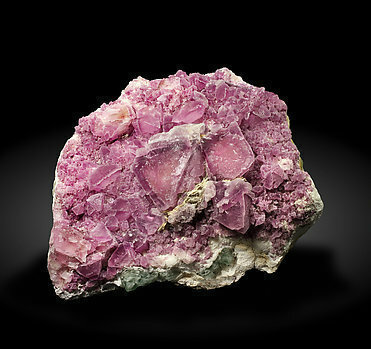 The color, clearly pink in daylight, acquires brownish shades under electric lightning. 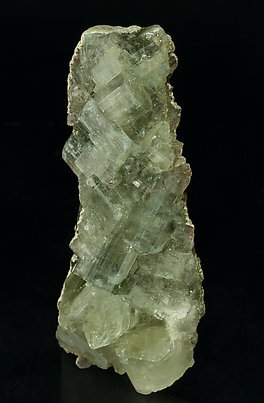 A novelty at Tucson 2014. 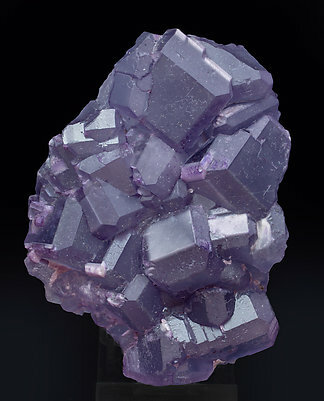 Aggregate of prismatic Fluorapatite crystals with a dominant prism and complex terminations, very rich with crystalline forms. 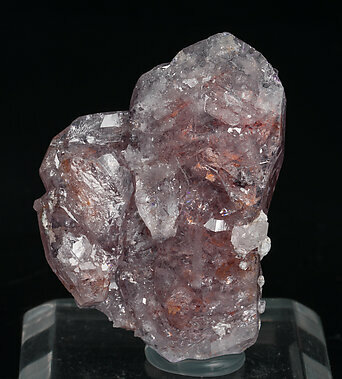 They are translucent, extraordinarily bright and are with small Tourmaline crystals. 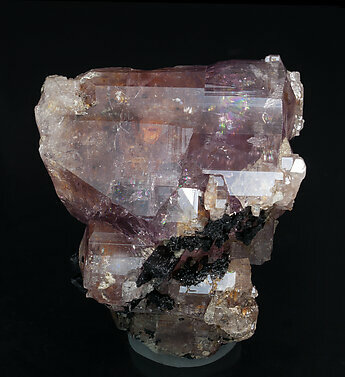 The color, clearly pink in daylight, acquires brownish shades under electric lightning. 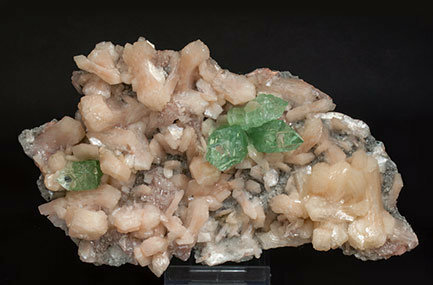 Aggregates of very sharp Fluorapophyllite-(K) crystals that are very transparent and bright, with an intense and uniform green color and on a basalt matrix coated by nice pink Stilbite-Ca crystals. 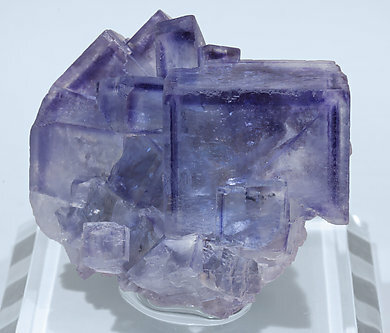 Group of very sharp cubes of Fluorite, one of them very large and clearly dominant. 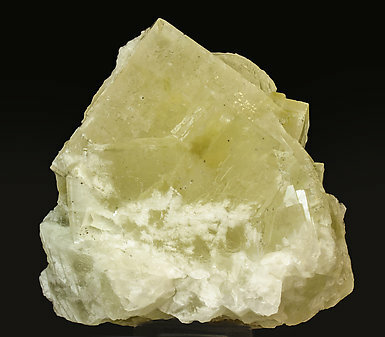 They are translucent, bright and have a yellow color with slightly greenish shades. 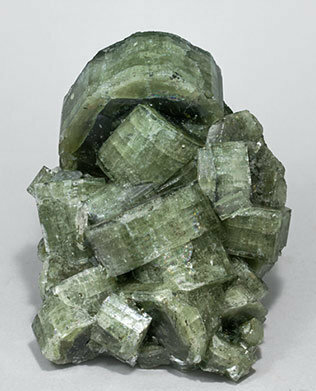 The sample, whose edges are more transparent than the central area, is very representative of this classic Catalan locality and its crystal size is greater than usual.